Today I found out the song Jingle Bells is thought to have been written for a Thanksgiving Sunday school program. 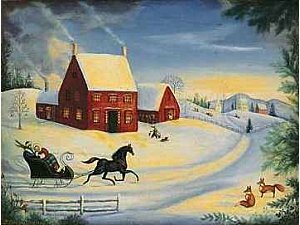 Jingle Bells was originally called One Horse Open Sleigh and was written by James Pierpont sometime between 1853 and 1857. At the time, Pierpont was working as an organist and music director in Savannah, Georgia. Pierpont was hired on by his brother, John Pierpont Jr. who was the Reverend there, after James’ business in San Francisco burned down. It was here that he composed One Horse Open Sleigh, reportedly for a Thanksgiving program. He later publicly released the song through Ditson and Co. of Boston in 1857, but it wasn’t terribly popular. Pierpont tried again to release it in 1859 under the new title Jingle Bells, with it once again flopping. However, from there, it did slowly gain in popularity and became associated with Christmas, rather than just as a general sleigh-song, which were a popular type of song at the time among teenagers (think “fast cars / pretty girls” songs). By 1890, three years before Pierpont’s death, the song had become a huge Christmas hit and from 1890 to 1954 it managed to maintain a spot on the top 25 most recorded songs in the world. “Bells on bobtails ring”; “Just get a bobtailed bay”: A “bobtail” is the tail of a horse where the hair has been cut short in order to keep it from getting caught in the reins. This was a very common practice in sleigh races particularly. “And then we got upsot”‘: This is indicating that the carriage tipped over. “Two forty as his speed”: This implies the horse is going about 22.5 miles per hour (traveling a mile in two minutes and forty seconds). The word “jingle” in “jingle bells” is often mistaken as an adjective with “jingle bells” being a type of bell. In actuality, though, it is thought by musical historians to be an imperative verb, giving the order to jingle bells. On December 16, 1965, astronauts Tom Stafford and Wally Schirra on Gemini 6 sent the following message to Mission Control: “We have an object, looks like a satellite going from north to south, probably in polar orbit… I see a command module and eight smaller modules in front. The pilot of the command module is wearing a red suit….” The two then proceeded to sing the first ever song broadcast from space, Jingle Bells, with a harmonica and bells accompanying, both of which they had secretly smuggled aboard. The harmonica used in this performance was only one inch long by 3/8 of an inch thick and was a Hohner “Little Lady”. Due to the fact that Jingle Bells is one of the most performed and widely recognizable songs on Earth, Pierpont was inducted into the Songwriter’s Hall of Fame in 1970.